Experience the power of densiplex. An invigorating blend of ayurvedic herbs that help power Invati. 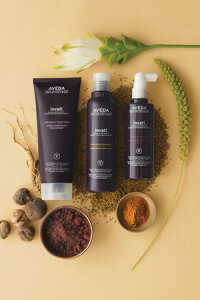 invati™ exfoliating shampoo – removes build-up that can clog pores and renews the scalp. invati™ thickening conditioner – restores strength and improves hair elasticity, reducing breakage. invati™ scalp revitalizer -helps energize and rehabilitates the scalp around the follicles when massaged in. Come in for an Invati treatment today and experience fuller, thicker and healthier hair.